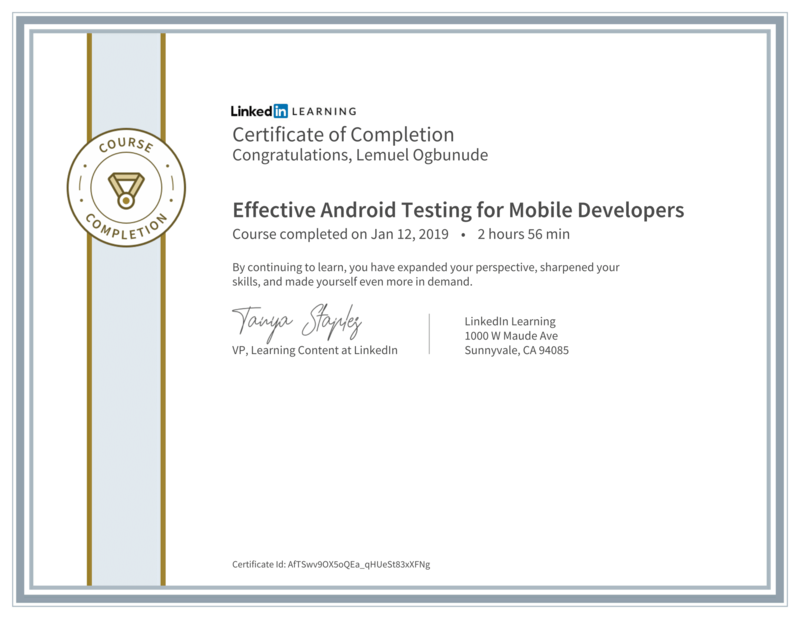 I am Lemuel Ogbunude, an enthusiastic Android developer, lifelong learner and life long teacher. I love Jesus Christ and I love people. As a lifelong learner, I believe that discipline and diligence is key to learning anything. As a lifelong teacher, I believe that teaching is a great way to share what you have learnt and better understand topics. 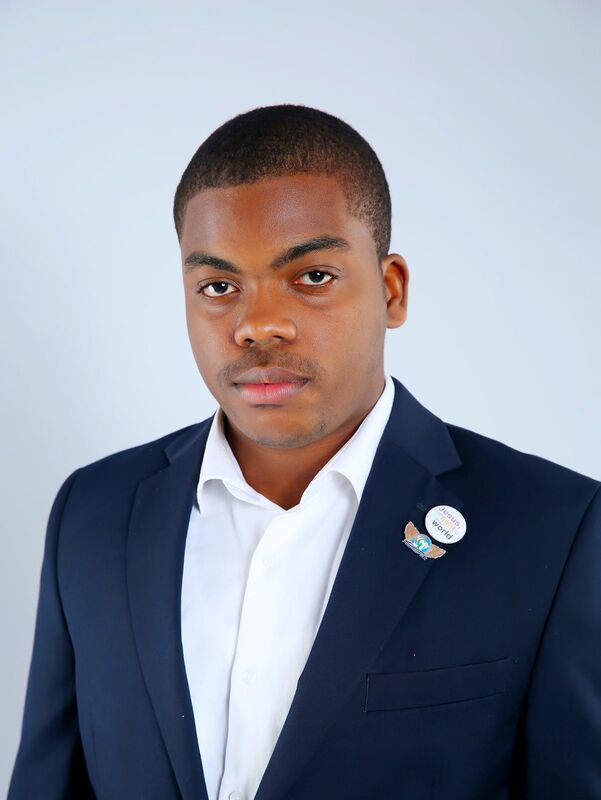 I have a YouTube channel where I share my knowledge and give valuable tips: Lemuel Ogbunude. I use technical writing to share my knowledge and also learn more about specific topics. I specialize in Android development and backend development with Spring Framework. I enjoy teaching using videos as I do on my YouTube channel. 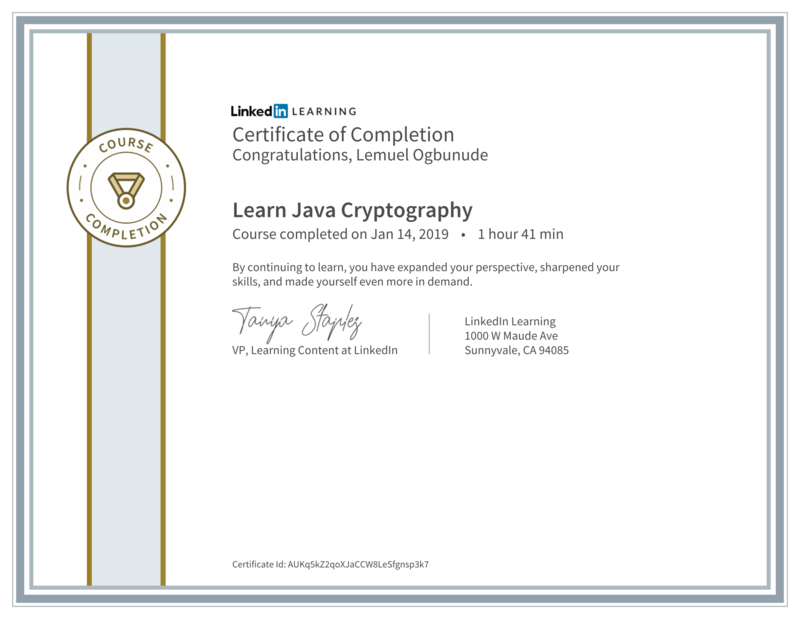 The Java Cryptography course taught me the the basics of Java cryptography using the Java Development Kit (JDK) crypto libraries: Java Cryptography Architecture (JCA) and Java Cryptography Extensions (JCE). 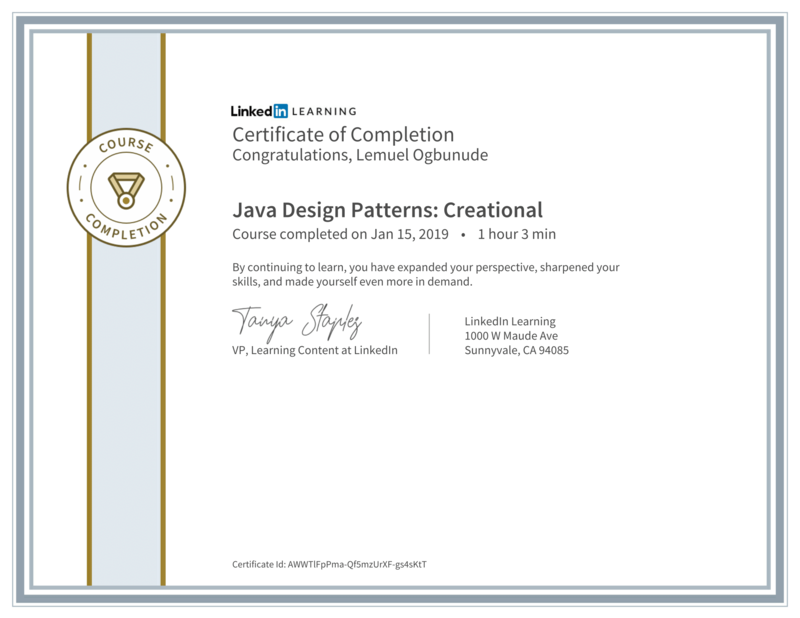 This course takes a deep dive into creational patterns, which can help me create more flexible, reusable objects. The Instructor, Bethan Palmer, covered the five most popular creational patterns—Builder, Singleton, Prototype, Factory Method, and Abstract Factory—as well as concepts such as multithreading, mutability, and hierarchies. There's a difference between knowing how to implement testing and knowing when and why to do it. In this project-based course, I got acquainted with best practices for testing Android apps by walking through a development workflow where testing is integrated throughout the process. 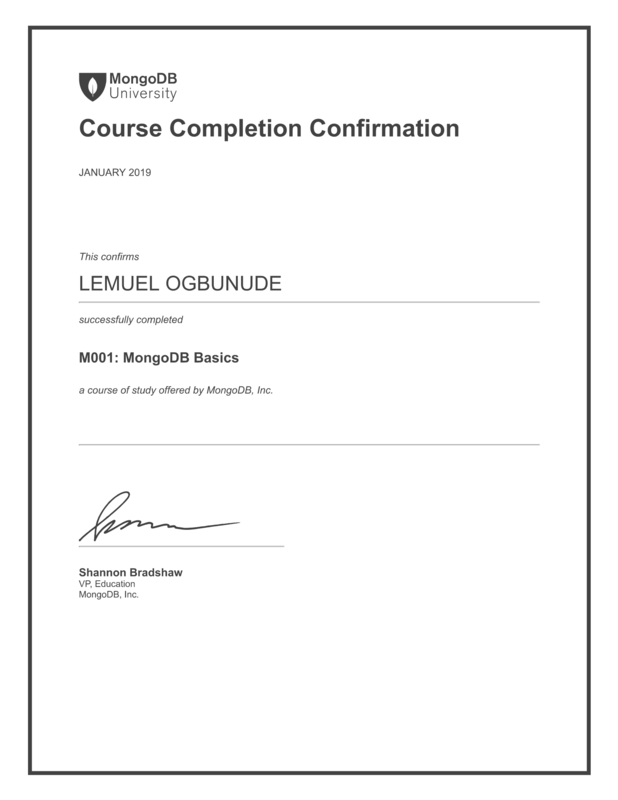 I learnt the basics of MongoDb, how to use Compass, the MongoDB GUI, the MongoDB document model and basic schema design, the MongoDB query language and how to use Atlas, MongoDB's hosted database as a service offering. Lemupass is a password manager which allows you sync your passwords and get it on any device. There is also a feature which allows users share passwords, for example in the case of a Wi-Fi password, with other users who also have the application. Payant Android is a library that I built that can be used to access features on your Payant account dashboard. Payant is an invoicing and payment software that allows freelancers, small and medium sized businesses to craft beautiful invoices, send payment reminders and accept instant payments directly into their bank accounts online from anyone, anytime and anywhere in the World. BION is a Biometrics Attendance App which can be used for capturing and viewing the attendance of staff in organizations, people in institutions or at events where identity verification is needed. Get user information, pictures and register fingerprints. Copyright © 2019 LEMUBIT, All rights Reserved.